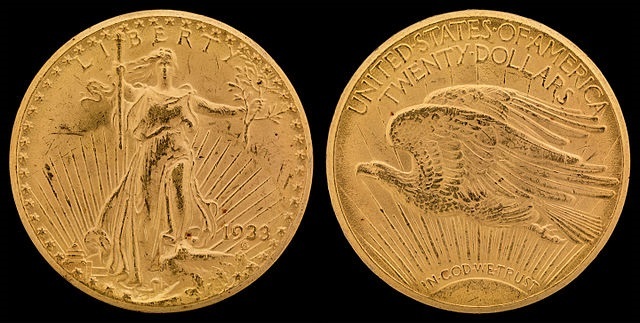 In late August of 2005 the US Mint seized ten 1933 Saint-Gaudens Double Eagle coins gold coins from a Philadelphia jeweler. Many consider the total value of the coins to be incalculable. They are among the rarest in the world. The story of Langbord and how her family came into possession of the coins dates back decades when they were first minted. In the early 1930s the US was in the grip of a banking crisis. Banks started to fail as investment banking losses mounted. The problem worsened when panic set in causing bank runs in which vast numbers of account holders withdrew their funds simultaneously. As part of a solution, president Franklin D. Roosevelt issued an executive order. He demanded that citizens turnover any gold in their possession to the Federal Reserve bank. Eventually, he passed the Gold Reserve Act in 1934 outlawing the circulation and private ownership of US gold coins. This new law meant that the recently struck 1933 Saint-Gauden Double Eagle coins were no longer legal tender. The mint melted the coins and reserved two for inclusion into the U.S. National Numismatic Collection. The US mint thought the Gold Reserve Act was the last chapter in the story of the Saint-Gaudens Double Eagle. Unknown to the mint, a number of these coins found their way into the hands of private collectors. In time, the Secret Service learned of the missing coins. They started an investigation. In the first year of their work agents recovered seven double eagle coins. Eventually, their investigation led them to an unexpected place: Egypt. King Farouk of Egypt owned a double eagle coin. He purchased it in 1944 by applying to the US Treasury for an export license. The request was granted because at the time, the US mint was still unaware of the theft of the coins. The US attempt to recover the coin but World War II derailed efforts. Later, in 1952, Farouk fell from power after citizens staged a coup. Officials auction his possessions. The US requested the coin, and though the Egyptian government agreed, the piece mysteriously disappeared. In 1996 law enforcement recovered the coin in a sting operation at New York’s Waldorf-Astoria Hotel. The coin was found with a British coin dealer who swore under testimony that the piece traced back to King Farouk. After its recovery US agents stored to coin in reserve vaults at the World Trade Center. Just two months before September 11th officials moved the coin to Fort Knox. The fervor surrounding this particular coin kept agents on the lookout for more. Eventually they found what they were looking for in the hands of Joan S. Langbord. In the following years a series of trials resulted in the coins bouncing between the Langbord family and the US government. Today, they reside with the Federal government. Some believe there are still original 1933 double eagle coins hiding in tin cans and basements. We’ll likely never know how many are out there. But, we do know they’re valuable. In 2002 an anonymous collector purchased one for $7.59 million.